Durable construction with anti-shock EVA padding protects from simple slips and drops, the V7 Ultra Protective Sleeve of iPad or tablet PC is compact and allows you to safely transport your iPad or tablet PC in any bag or just on its own without adding bulk and weight. The minimal design, yet sturdy sleeve with a soft velvety lining comes allowing you to customize your tablet sleeve to suit your personality. Extremely light weight, it uses a form fitting material that accommodates a tablet with a 10.1-inch display. Designed for on-the-move individuals who prefer to carry their iPad in style, the V7 Ultra Protective Sleeve has all the features you need with eye-catching style and great protection for your iPad or Tablet PC. Key features include holding an iPad or Tablet PC with up to a 10.1-inch screen, a zippered closure, and an extra-cushioned interior. Sleeve for iPad and tablet PCs up to 10.1 inch. The rugged Neoprene with anti-shock EVA padding material allows the Ultra Protective Sleeve to shield against everyday wear and scratches, and absorbs impact without adding bulk. The black material color with textured interior delivers adequate protection for daily iPad or tablet use as well as adding a touch of style. And its light weight means you can carry it anywhere. 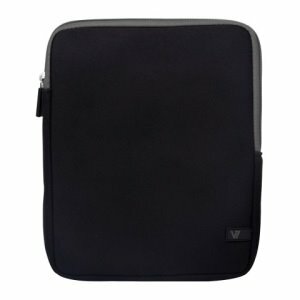 The V7 Ultra Protective Sleeve is designed especially to fit all iPads and other tablet computers with screens up to 10.1 inches. Its slim design features a soft, textured inner lining for screen protection, with a sturdy zippered closure for easy transport. The black material color with textured interior delivers adequate protection for daily iPad or tablet use as well as adding a touch of style. And it is lightweight which means you can carry it anywhere.